That's what I get for just doing a quick Wiki walk -- Maughan Library -> Strand Campus -> OK, that's where it is? Sure! "LB" means London Borough, I take it? This node is 13 steps away from the master node that represents the whole world. It is the only node of this size. How many points/unique locations it or its four children contain is still an open question. How about nodes 12 steps away from the master node? There are 20 of those, with the majority in the UK. Three are in Puerto Rico. One at the Cincinnati OH / Covington KY line. 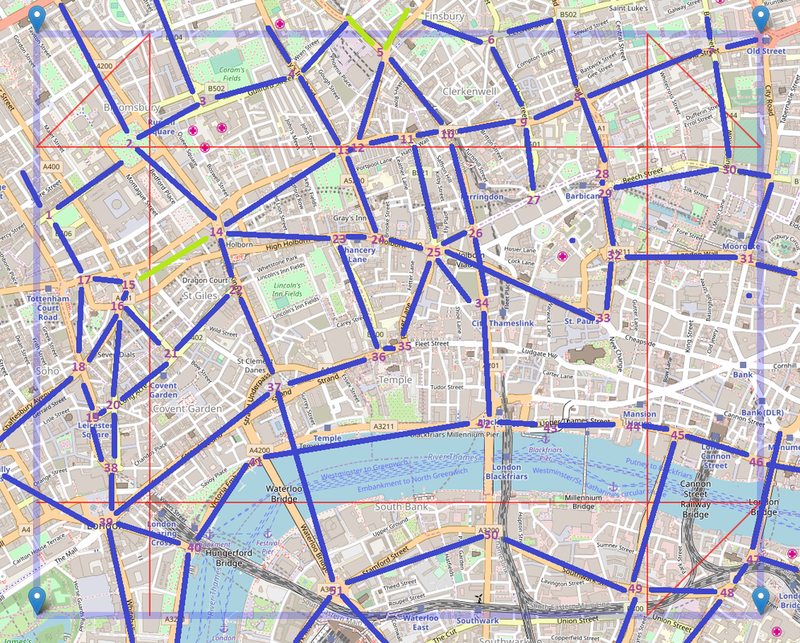 Seems natural, with dense road networks in these places. And there's one in... Portland, meaning I was probably a bit too generous with waypoints when designing US1Alt, ME77 & pals back in the day. The least dense node with 1 or more waypoints? 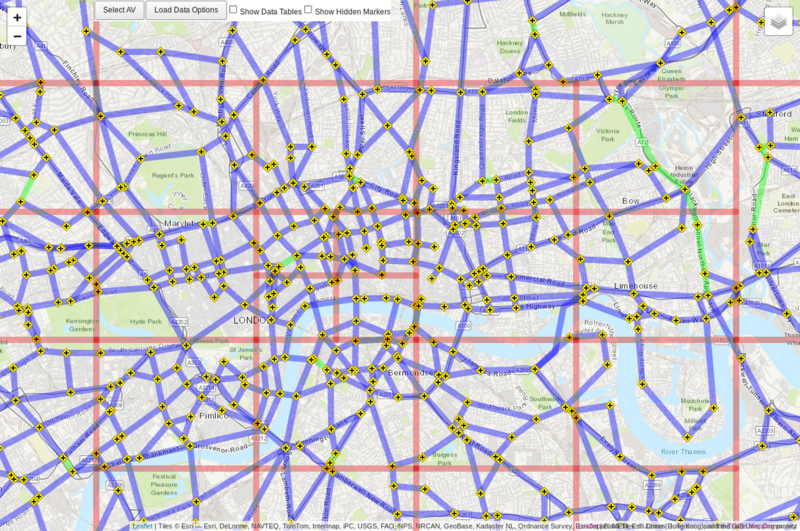 For it: 51 points (non hidden, all but 7 junctions between two routes). 69 edges between them (one a concurrency) and 26 between them and points not inside the box (two a concurrency). Looks like we had almost the same idea. Here are the other 13th-level nodes, with a quick-n-dirty name I picked for each. Zoom in a bit, search for the code in the vertex/edge list, and click. Center your mouse, Alt+Tab away, move mouse away from canvas, Alt+Tab back*, and click the OSM or Google links. The WaypointQuadtree has been initialized all these years with the latitude and longitude bounds swapped. It hasn't broken anything, but just led to a sub-optimal distribution of child nodes. After fixing it, we're down from 42757 to 35165 total nodes with the latest HighwayData. With the bug, The nodes along the western edge of the map have their eastern boundaries, and centers, asymptotically approaching -90°, rather than the normal -180°. The de facto W bound of each node is -90°, but points W of there can still be inserted normally, because they're W of the parent node's center -- be it 0°, -45°, -67.5°, -78.75°, etc. As more points are added and these nodes are refined, they effectively become narrower and narrower "stripes" stretching all the way west. The mirror image applies along the eastern edge, of course. SE_B http://www.openstreetmap.org/?lat=35.131531&lon=-89.998627A bit smaller than central London, innit! With latitude, things are less interesting: there are just four extra nodes each N of the N pole & S of the S pole, that never receive any waypoints. I realized my list file now has 3784 lines, which got me wondering how many people have files that long. Mine is 16th longest. One user (vespertine) has over 8000 lines, two more are over 7000, two more over 6000, and 2 more over 5000. 94 of our 224 users have at least 1000 lines in their list files. How many lines in the average .list file? How many HighwaySegments does the average traveler have .listed? I'm more interested in the number explicitly .listed, before concurrency augmentation takes place. Here are the current numbers of lines per .list file. Note that some will be invalid lines, comments, or blank lines, so consider them a bit on the high side in many cases. The average number of lines per file is 1235.8. Divided by 231 .list files, that's 18533.3 segments per .list. Most-clinched segment is VA I-95 84 86, with 128 travelers. Edit: There may be other segments tied at 128 travelers. I didn't check for more; this was simply the first one found. ^^ According to my log, I have 6,100 "good lines". This gives all segments ordered by number of travelers. It's 440,000+ lines long, but we can see that 13 segments are traveled by 129 travelers each, which is the most of any. I'd have to expand the query to join with the segments and probably routes tables to get meaningful information about those segments like the end waypoints and the name of the route. ^ Is there a fairly easy way to determine how many route segments have been traveled by only one user, aggregated by region and/or system, compared to the total number of segments? That's among the things I'd like to add. Somewhere in the forum or in a GitHub issue, this was referred to by someone as a "TM Pioneer" - the only traveler to clinch a segment/route/connected route. I think I just need to take a day to experiment with some interesting SQL queries and get them into appropriate existing or new places in the web front end. I envision maps where segments are colored by number of travelers, possibly with some special highlighting of segments traveled by a single user. I envision maps where segments are colored by number of travelers, possibly with some special highlighting of segments traveled by a single user. Based on my own travels, you'll have quite a few route segments traveled by a single user, especially in preview systems like cansk. Might not be "special" enough to warrant highlighting. Edit: Ignore this for now. List Names are showing up incorrectly. E.G., tikester's trailblazing segments of either CA US101BusPas or CA US101HisPas are showing up as CA US101 proper. Edit: I should note that this is also only for segments explicitly .listed by a traveler, without any augments for concurrencies.